It scarcely seems like nine years since MT founder and former editor-in-chief Keith Summers first asked me to review a release of Bahamian music, for its short-lived and much-missed stablemate Keskidee. Over the years a further half dozen items have reached these Oxfordshire shores (on the banks of the Lymbrook) and I have been consistently astounded by the quality of material and performances both. 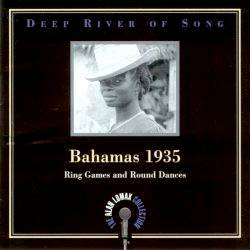 It has now been four years since I reviewed The Bahamas - Islands of Song, and I still haven't visited that distant and romantic clime, and such a possibility looks increasingly less likely. But my affinity with its geography, culture and people remains undiminished. Similarly unlikely are many (if any) future releases of vintage Bahamian music, whether the quality of this present one or less so. I never got to review the first volume showcasing Lomax's collecting efforts on the islands during the summer of 1935 (Rounder 1822), but certainly shelled out hard earned cash for a copy, and was amply rewarded with perhaps the finest release of that year. On that CD the track Round the Bay of Mexico made my short hairs stand erect, and I played it to aficionado and heathen alike, as an example of the best that traditional music has to offer. Now Fate has stepped in to give me an opportunity of telling about its companion. Volume one consisted of the anthems, shanties and launching songs already familiar to those with the Charters Folkways trilogy and the Siegel and Stecher pair on Nonesuch. This second volume concentrates on the rather less well known round and jumping dances and ring games. The sleeve notes are so comprehensive and incisive that they serve largely to usurp the reviewer's stock-in-trade. One might cite as an example the paragraph heading the transcription of the words to track 22. None of this is surprising, given that the author of the song notes is that doyen of Bahamian music Guy Droussart, and that Dr Nicolette Bethel draws heavily upon her father's definitive study of these cultural forms, to provide an illuminating introductory essay. The ring shouts and jumping dance numbers are vocal numbers accompanied by complex rhythmic hand clapping and/or drumming (with one featuring, in addition, a musical saw, an 'instrument' still found within the current tradition). If the rhythms are exciting, so too, for the most part, the harmonies chosen by the participants. Listen, for instance, to the tracks by the small female group led by Elizabeth Austin, and see if you don't get goosebumps. And there, too, is that incredibly deep bass line, heard on the earlier 1935 set, and still prevalent at the date of Seigel and Stecher's activity during the 1960s. Track 6 features what must be the very first recording by the legendary Frederick McQueen, a man lionised both among his peers and by outsiders such as Sam Charters (and even myself - see my enthusiasm for The day is so long and the wages so small elsewhere on this site). His vocal is strong, as it needed to be to lead a group of similarly strong singers, and contains none of that personalised anguish heard on the Charters recordings, permitting us a rare insight into an evolving vocal style. For this is not solo music, but communal call and response by leader and chorus mainly, but others are not afraid to join in with the leader where the words are known. Many items are of the most basic form one, two or four lines repeated over and over, but with variations in rhythm and harmony which maintain the interest. Within the traditional performance context, of course, the words become almost unnecessary, as function dominates form. Tracks 11 through 13 append fascinating brief snatches of the drummer demonstrating some of his rhythmic techniques and patterns. The photographs are evocative, with some taken contemporaneously with the recordings, during Lomax's 1935 field trip, and others depicting relevant, though undated scenes, drawn from the collection of Guy Droussart. From the first of these sources come a number of portraits of both male and female, street scenes, and a particularly Turner-esque one depicting a group of small fishing boats in Nassau Harbour. Only a small portion of this material has been commercially available before, and then only on an obscure Library of Congress album (AFLS 5 - issued first on shellac at 78 r.p.m., then subsequently on vinyl), where it sat with uneasy cultural ambivalence alongside Lomax-collected items from 'French Louisiana' and 'the Spanish Southwest.' For this issue, then, we ought to offer thanks and support (just buy it!). But there is a wider picture to consider. There are rumours that Rounder are cutting back on their output of more recent US field recordings, though not on the Lomax programme. And if future releases prove to be only, say, half as good as this Bahamian volume we have good reason to be grateful.